Painting wood paneling is not that hard and the result is well worth it. Dated wood paneling stands toe-to-toe with ugly wallpaper as the last thing buyers want to see when they view a house. If your home suffers from wood paneling mania of the past and you can't afford to replace it, don't despair! If it's in good condition you can paint right over it with great results, as in the photo on the right. If you're thinking about taking the paneling down, consider this... the paneling may have been put up to mask wall damage underneath. Do you want to take the chance? 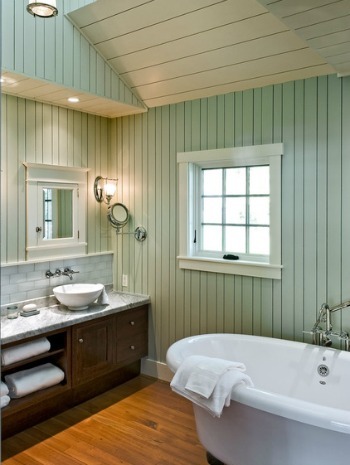 Painting wood paneling can be very rewarding. Applying paint colors like, a crisp white, soft robin's egg blue, or other light neutral paint colors can give any room that cozy cottage feel that so many people love. I lived in a house in the 1980‘s that had dark wood paneling in every single room. It was depressing and I was determined to do something about it. This was my first “experimental” home, where I learned how to wallpaper, texture walls, (ugh!) put up chair rail molding, and paint over wood paneling...all without the internet to guide me. I made a few faux pas along the way, but overall, was pleased with my results...except for the textured walls. Multi purpose primer sealer, (oil-based primer covers paneling better, but must dry for 24 hours. A latex primer will dry in an hour) Tinting the primer in the same, or a similar paint color as the final coat will hide the paneling better. What buyer wouldn't love this cozy room? Be forewarned...once you paint over wood paneling, you cannot undo it! 1. Remove all switchplate covers from the wall. Mask off the ceiling, trim, baseboards, and windows. Be sure to protect the floor with a drop cloth. 2. 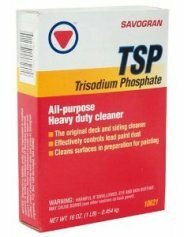 Wash down the paneling with TSP following the manufacturer’s instructions. If the paneling is really slick, use a deglosser as well, otherwise the paint may not stick. Look for TSP with deglosser included. Wear gloves and eye protection when using this product. An option to TSP is a mild detergent and water mixture. Let dry. 4. When dry, sand the spackled areas so they are flush with the wall surface. Sand the paneling with 100 grit sandpaper. A pole sander or sanding block will make this job easier. Don't over sand-- you just want to roughen the surface for better paint adhesion. If you plan on painting the trimwork, (baseboards, door, and window trim) sand it also. Wipe dust off with a tackcloth or damp rag. 5. If you see any gaps between the trimwork and paneling, apply some caulk and let it dry completely before painting. 6. Use a roller and brush to apply the primer paint to the paneling. Roll first, then brush. Use your brush to work the paint into the paneling grooves. Use a brush to paint the trimwork. Dry completely. ﻿6. This step is only for those who want to fill in all the grooves to create a flat wall effect. AFTER PRIMING, and when paint has dried, take your spackle and putty knife and fill in all the grooves. This process is very labor intensive. When the spackle is dry, sand it smooth. 7. Paint in the same manner with an interior latex paint. Again, work the paint into the grooves with a brush AFTER you roll the paint on. Let dry and repeat with another coat of paint. On the second coat, don't use a brush (except for cutting in next to moldings and in corners). This will prevent brush marks from showing on your finished surface. Watch the amazing kitchen transformation in the video below by johnpetersilk!